"The victims of our government's lethal actions deserve better, as does the American public in whose name the Trump administration is secretly killing people." The Trump administration on Tuesday flouted two major deadlines for disclosing the number of civilians killed by U.S. military forces: one public report that was mandated by an Obama-era executive order and focused on drone strike deaths; and one report to Congress that is supposed to detail all civilian deaths tied to U.S. military operations. “The Trump administration’s decision not to comply with even the meager transparency requirements of the executive order is a dangerous low,” declared Hina Shamsi, director of the American Civil Liberties Union’s National Security Project. “The executive order that requires the civilian casualty report is under review,” and may be “modified” or “rescinded,” while a spokesman for the Pentagon said the congressional report is slated to be provided to lawmakers by June 1. In the time since President Donald Trump has been in office, his administration has secretly changed U.S. policy rules on the use of lethal force abroad, refused even to admit the new policy exists, increased the number of lethal operations in places like Yemen and Somalia, and—according to independent monitoring groups like Airwars—was responsible for a significant uptick in civilian deaths in Iraq and Syria in 2017. In this context of increased secrecy, expanded military operations, and credible allegations of civilian casualties, congressional scrutiny of the executive branch is crucial. The first report on casualties caused by counterterrorism strikes was released in July 2016 and disclosed up to 116 civilian casualties during seven years of strikes. 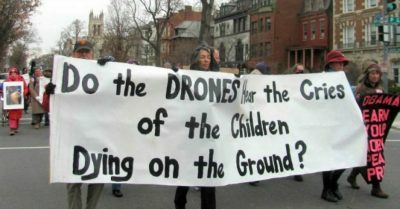 The report was criticized by independent groups, such as the New America Foundation and the Bureau of Investigative Journalism, which estimated between 200 and 325 civilian deaths over a similar period. Just before Obama left office in early 2017, the administration released a second report that disclosed the deaths of 441 fighters and one civilian in 2016. Even though the White House refused to release numbers, a spokesman wrote in an email that there was no increase in civilian casualties in 2017. But counterterrorism experts cast doubt on that assertion, noting that there was a big surge in drone strikes in 2017, especially in Yemen, where the United States launched 127 strikes, up from 32 in 2016.